Binary pyramids can be used for multiresolution pattern representation. The two “standard” pyramids schemes, OR- and AND-pyramids, have, however, serious drawbacks, as they distort the shape significantly. In OR-pyramids black pixels spread all over the array due to expansion and merging of close regions. The shape of the original pattern is rapidly blurred. In AND-pyramids narrow regions of the initial pattern may either completely vanish or become disconnected. In both cases, the shape of the pattern is not preserved. 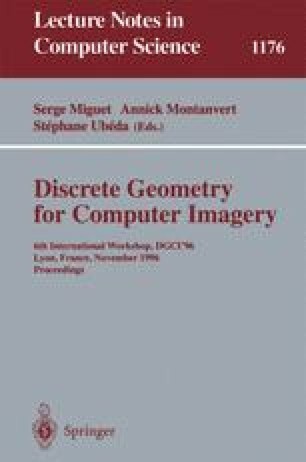 Here alternative approaches, aimed at improving shape and topology preservation in binary pyramids, are presented. The first approach combines the OR and AND rules, whereas the second approach uses grey-level images as an intermediate step. The algorithms are easy to implement and produce significantly better results than the ones obtained by OR/AND pyramids.